(Oregon Coast) – Much happens along this shoreline on Independence Day, but not all of it on the Fourth itself. In fact, if you plan it right, you can enjoy three days of fun fireworks as two towns have their celebrations on either side of July 4. You can also see who still may have lodging availability for the Fourth of July here. But make sure to make plans immediately as these openings change quickly. Included in this year's roundup of Independence Day happenings are some visitor tips to help you avoid the crowds and other mishaps. Seaside Fourth of July. Independence Day comes in different forms in this north Oregon coast town. 4th of July Parade & Old-Fashioned Social. Enjoy the Independence Day parade featuring several Drum & Bugle Corps from the Pacific Northwest, including the Oregon Crusaders, Santa Clara Vanguard, Eruption, and The Columbians. The parade begins at 11am at the Seaside Museum & Historical Society on Necanicum Drive at 5th Avenue, making a loop through downtown Seaside. Par starts at 11 a.m. and goes until 4 p.m. Seaside's Old-Fashioned Social takes place from noon to 4pm at the Seaside Museum & Butterfield Cottage, 570 Necanicum Drive. Enjoy an old-fashioned celebration for all ages, including a cake walk, face painting, live music, children's games, food booths, raffle drawings, silent auction and Bingo. Free, plus free admission to the museum too. Fireworks begin at dusk. By far one of the largest on the Oregon coast, they shoot off from the Turnaround, in the middle of town. Visitor tips: tens of thousands hit these beaches and you'll experience better parking and lesser crowds at the southern and northern ends of town. (503) 738-7065. See the Seaside Tour, Map. Cannon Beach Fourth of July. No fireworks in town because of bird sanctuaries on top of Haystack Rock. However, their parade is famous. The parade route starts northbound on Spruce street and then loops back onto Hemlock street headed south through downtown. Face painting is at the American Legion and strawberry shortcake at the US Bank. For more information, call 503-436-2973. See the Cannon Beach Virtual Tour, Map. Manzanita – Nehalem Bay. No fireworks or parade listed this year. This could change, however. 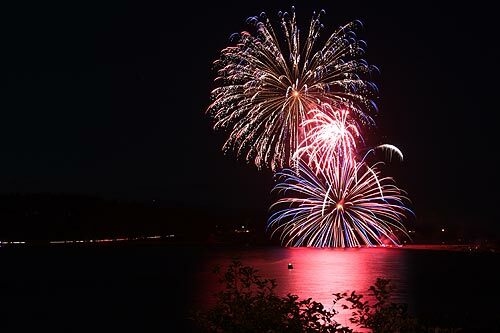 Nearby, Nehalem Bay Winery does feature a 4th of July party with a classic rock band. Times not listed. 34965 Highway 53. Nehalem, Oregon. 503.368-WINE. 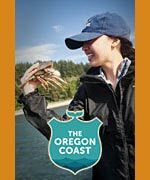 See the Manzanita, Nehalem Bay Tour, Map. Rockaway Beach. Parade time has not been announced this year, but it will include a National Guard flyover. Wiener Dog races at the city park at 1 p.m. Also at that time: Fun Day at the Beach events for children at the main downtown beach access. Fireworks at dusk. Visitor tips: park at the northern or southern end and avoid the clusters in the middle of town. See Rockaway Beach Vistor Info, Map. 503-355-8108. July 5. Pacific City Fireworks. These happen at dusk on Saturday, July 5, on the beach at Bob Straub State Park. Visitor tips: organizers suggest arriving by 8 pm. See the Pacific City, Three Cape Tour, Map. Lincoln City and Gleneden Beach. 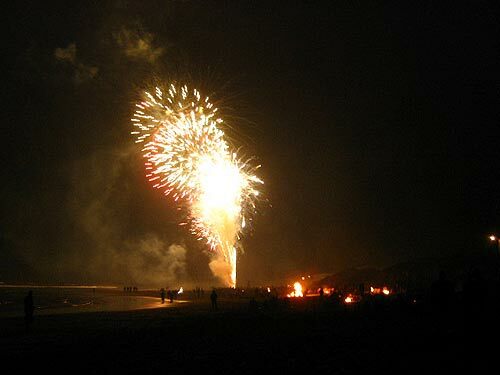 Huge fireworks over Siletz Bay in Lincoln City and a parade at Gleneden Beach during the day. Daytime in Gleneden Beach: Pancake breakfast at Gleneden Beach Community Club (110 Azela St). Ham/sausage, eggs and all the pancake one can eat. Adults – $5 ea, Children (4-10) - $2.50 ea. Craft Fair & Food Court at Eden Hall (Gleneden Beach Loop Rd). Parade at 1 pm. Lincoln City: Events differ around town, including some sales at independent shops. 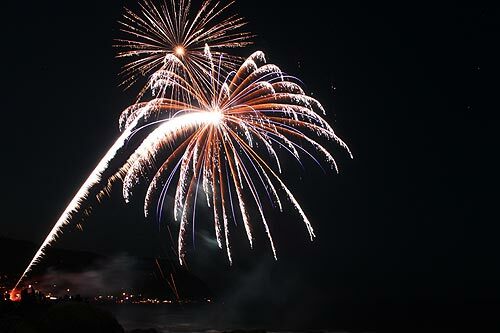 Free fireworks over Siletz Bay in the Historic Taft District of Lincoln City beginning at dusk. Visitor tips: stake your place out Siletz Bay early in the day. Will still be visible close to northern end of town, however. 800-452-2151. Website. See Lincoln City, Oregon coast Tour, Map, or Gleneden Beach, Depoe Bay Tour, Map. Depoe Bay. No events listed for that town but individual bars will likely have special events. Newport. Fireworks over Yaquina Bay at dusk. A powerful and memorable experience as the mountain cause the explosions to bounce and echo in dramatic fashion. Visitor tips: drive across the bridge close to fireworks set off and you'll see boats fire off flares which wind up floating at eye level briefly. Best parking options are at South Beach. 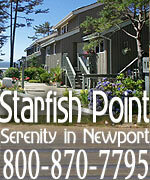 Newport chamber site, or see Newport, Oregon Virtual Tour, Map. July 3, Waldport. 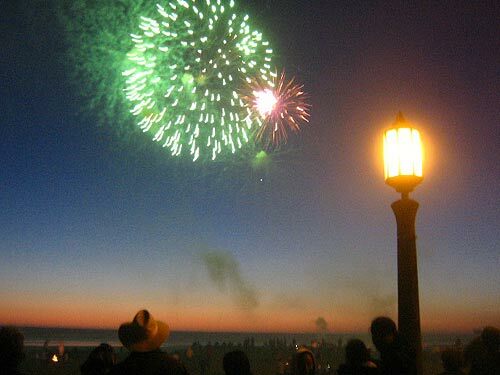 Thursday: enjoy fireworks over Waldport. It is Waldport's Centennial Celebration as well. Fireworks over Alsea Bay at dusk. Visitor tips: lots of sandy spots and nooks and crannies throughout town, but better on the northern end, or at Patterson State Park just south of town. 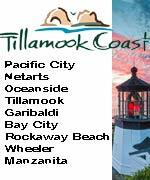 See the Waldport, Seal Rock Tour, Map. Yachats Fourth of July. This one comes in many segments. Yachats Lions Pancake Breakfast. Friday 7:30 - 11:30 am. Breakfast includes eggs to order, pancakes, ham, sausage and coffee. Donations will be accepted. Yachats Lions Hall, W 4th & Pontiac, Yachats. 541-547-5171. July 4 Ice Cream Social: Yachats Ladies Club pie socials are famous for their astounding variety of delicious pies. Each slice is a generous 6th of a pie and costs $3.50. Add a scoop of ice cream for an additional fifty cents. A variety of beverages will also be sold. Come early for the best selection and before the pie is gone. Friday 11 am - 3 pm. Yachats Commons, Hwy 101 and W 4th St, Yachats, Oregon. La De Da Parade at Noon. Wacky, whimsical, low-tech fun which has even included the mayor riding on a lawn mower. Before and after the parade explore the town to enjoy special treats and great food, games, art and live music. Find a place on the beach by the mouth of the Yachats River to watch the afternoon Duck Race. Throughout Yachats. Fireworks at Dusk. A spectacular show erupts in the skies. Visitor tips: park and watch from extreme southern or northern edges of town. Still great views from along the 804 Trail. See the Yachats Virtual Tour, Map.